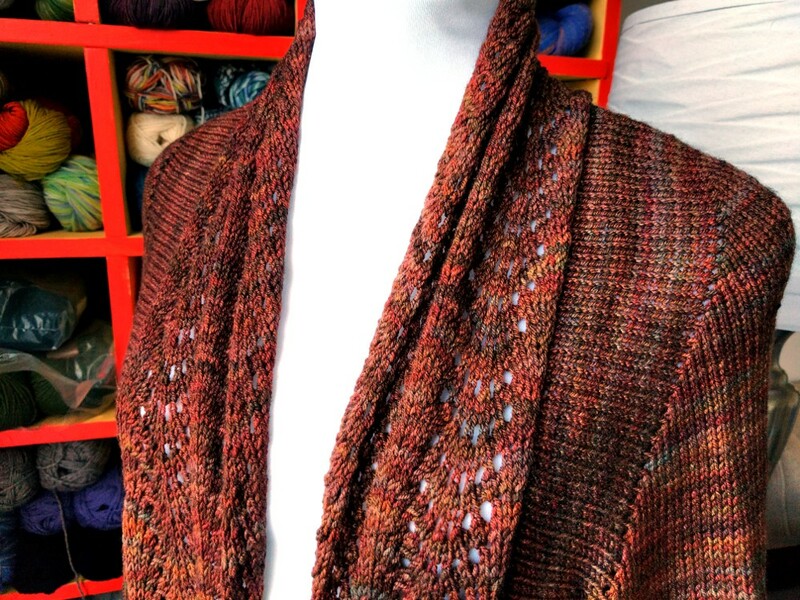 You know how I said that my latest cardigan project had gotten to the point where I could just zoom along on it to the finish? Well, “zoom” turned out to be a good word to use. I worked on it exclusively and the finish line raced forward to meet me much faster than expected. I managed to get it done, ends woven in, washed, and blocked so that I could show it off at Knit Night on Friday. And another lightweight cardigan is added to my sweater stash. I worked a bit of that brighter skein into the bottom of the body, as planned. I like how it turned out – bringing punches of brighter color in here and there. The lace opened up nicely and drapes perfectly over the neck and shoulders. The armhole and sleeve cap shaping was a bit of a leap of faith. It stays put on my shoulders, but I’m not sure I would choose it over a different method next time. It is a bit bell-shaped, which I’m attributing to the line of center decreases at the top, and looks a tad funny when worn. I’m thinking that those decreases would have looked better if they stopped at the point where the horizontal plane of the shoulder turns to the vertical plane of the upper arm. Filing that away as a learning point for next time. 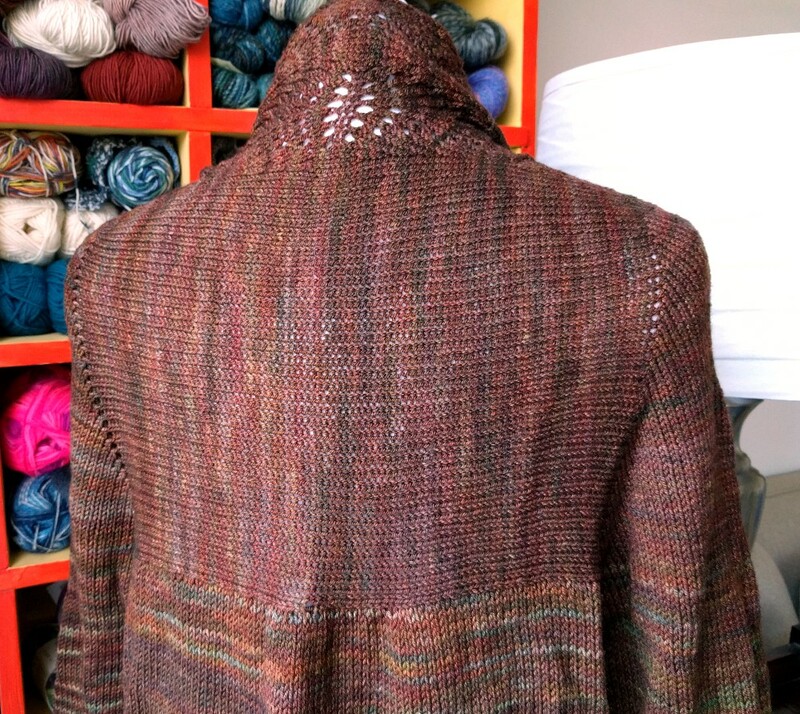 I ended up making the sweater very long – about jacket length – since I had plenty of yarn. Actually, I had so much yarn that there is one-and-a-half skeins left over even after working it to a generous size. I love having this problem. My friends are suggesting a matching hat and mitts to use up the leftover yarn. A note about the yarn… It was unexpectedly crunchy to work with, given that it is a merino and silk blend. However, once washed it softened up very well, and the sweater is just as luxurious to wear as expected. I’m going to chalk the crunchiness up to the dyer having not rinsed the yarn after dying it. There was an enormous amount of dye in the bathwater, and I had to rinse the garment six times to get the water even remotely clear. The colorway is a very old club version, and I have not had that much trouble with this dyer since, so I think they’ve learned a thing or two in the intervening years. If you’ve got this yarn in your deep stash, it is worth the work – just keep in mind to hand wash carefully the first time. The weather has turned warm again this week. A little midwinter thaw? 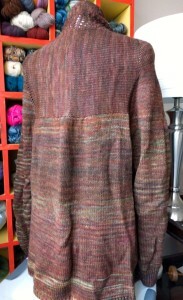 I think I’ll be wearing this sweater to the Madrona Fiber Arts retreat in Tacoma this weekend. 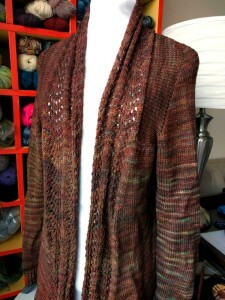 It’ll be just the perfect amount of warmth while I mingle with the other fiber lovers at the market. This entry was posted in Knitting and tagged knitting, lace, silk, sweater, wool. Bookmark the permalink.